Last night my sister sent a very excited e-mail to let me and my siblings know that our dad, Bob Moog, was going to featured as a Google Doodle in honor of his 78th birthday which is today. Ever since then I have been smiling ear to ear and as reactions flow in to Twitter, Facebook, my e-mail inbox and through media outlets around the world. I am incredibly proud of my Dad, and I know this is a special day and wanted to use this blog post to record the moment. I have always been proud of the legacy that my dad left and today’s Google Doodle serves as a good reminder that he is not done making an impact. He was an engineer and a musician and was able to combine those two passions and produce a break through invention that has inspired millions of people to create music which in turn shaped the evolution of music. And I can tell you he would have loved the Google Doodle. My hat goes off to Ryan Germick and Joey Hurst at Google for both caring and helping bring this little bit of goodness to the world today. And a huge shout out to my sister, Michelle Moog-Koussa who is the Executive Director of the Bob Moog Foundation. She has been working tirelessly to honor his legacy and advance science and music education. Be sure to follow the foundation on Twitter and Facebook. 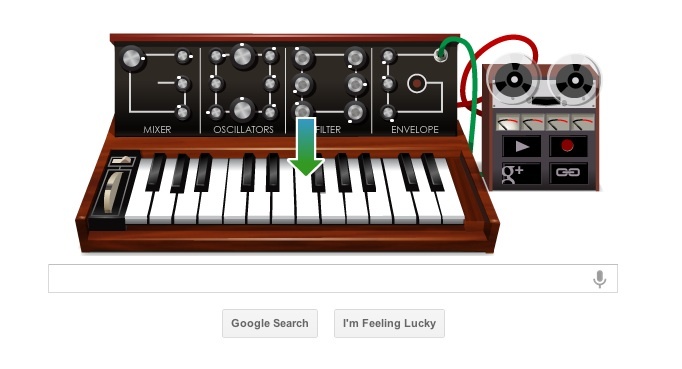 I have to say one of the most amazing things about the Moog synthesizer being featured on the home page of Google is realizing that Google has become such an important part of our culture. This doodle will be seen billions of times today and likely have tens of millions of people playing with it. That is really an amazing fact that speaks to the huge influence of Google. There is also a touch of irony in today for me. Like a lot of sons out there I have spent much of my personal life thinking about how my father might react to decisions I have made. And I have spent much of my business career thinking about how Google might react to the web properties we have built. Today those two influences in my life converged. There is a certain poetry in that convergence that makes me smile…. I am still looking for some really good recordings. Did anyone see some?